Ding dong the cartridge has gone. Well, maybe it has. 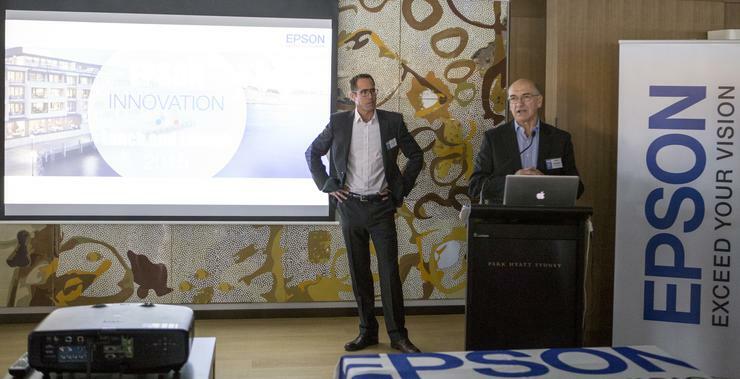 Not in all printers but certainly in Epson's newly revealed range of EcoTank printers which got the right royal treatment with a special launch at the Park Hyatt Hotel in Sydney. And there were at least 60 people on hand to witness the reveal. After a few speeches, and with a flick of the hand, a cloth was pulled back and three models of the EcoTank shone darkly (they are black). Flash bulbs popped, people wondered if they do really run 2 years on a tankful - and you get the feeling that a lot of consumers will be happy if they do. Because, let's face it, cartridges are messy, awkward to handle, sometimes awkward to find, and always run out least when you want them to. So what is Epson offering? The new EcoTank range consists of the Expression ET-2500, Expression ET-2550 and WorkForce ET-4500 aimed at the home user and the WorkForce ET-4550 for the home office user. The use of ink bottles means there are no cartridges to change, ever. If required one simply tops up the tanks and continues printing without worry. Additional high-volume ink bottles can be purchased (all ink bottles only cost $16.99 each except the large black ink bottle for the ET-4550 which costs $24.99) that have a drip free-free nozzle and resealable cap for easy storage. The replacement bottles also hold enough ink to print a claimed 4000 pages in black and 6500 pages in colour (ET-2500, ET-2550, ET-4500) and 6000 pages in black and 6500 pages in colour (ET-4550). The compact entry level ET-2500 has an auto-setup feature, which makes it simple to connect all computers and laptops to the printer. In addition users can print wirelessly from Android and iOS phones and tablets using Epson’s iPrint app. iPrint is free to download from the Apple App store or Android Play store and allows users to easily print web pages, Microsoft Office documents, photos and PDFs. The ET-2500 prints up to 4000 pages in black and 6,500 pages in colour and printing is in three easy steps - fill, setup and print. The ET-2500 also features multifunctional print, scan, copy and Wi-Fi options and up to 2400 dpi scanning. Next model in the home user area, the ET-4500, offers all the functionality of the ET-2500 and ET-2550 but edges in more flexibility with the ability to help put together and print important presentations or reports using its 30 page automatic document feeder to easily copy, scan and fax. The ET-4500 enjoys the same simple wireless connectivity as the ET-2500 and ET-2550 but boasts a larger 2.2-inch Mono LCD screen as part of its control panel. The ET-4500 also allows users to easily print from tablets or smartphones using Epson Connect and supports Android, Apple iPad and iPhone, Chromebook, Kindle Fire, Mac and Windows devices. The top level EcoTank printer in the range, the WorkForce ET-4550, really raises the bar for home office users as, in addition to having all the key features of the ET-2500, ET-2550 and ET-4500, it is powered by Epson’s unique PrecisionCore inkjet technology. Epson Australia general manager sales and marketing – consumer division, Bruce Bealby said, “EcoTank printers and printing are all about convenience and practicality. The ET-2500, ET-2550 and ET-4500 are ideal for those households with basic printing requirements that don’t want to continually order ink on a regular basis. "The technology is proven and has been highly successful in other markets and now its Australia’s turn. These EcoTank models are ideal for all your day to day printing needs such as recipes, homework, e-mails and photos and with two years’ worth of ink included, users know exactly where they stand from a cost point of view. At the heart of PrecisionCore is the PrecisionCore MicroTFP print chip. This print chip is modular and can be arrayed in various printhead configurations. Based on the thin film piezo (TFP) technology that Epson has been using in commercial large-format printers, the MicroTFP PrecisionCore print chip offers vastly improved basic performance compared to conventional piezo printheads, including faster speed and more accurate dot placement. The Expression ET-2550 (RRP $499) and the WorkForce ET-4550 (RRP $699) are available now at Harvey Norman. The ET-2500 (RRP $449) and the WorkForce ET-4500 (RRP $599) are available now at JB Hi-Fi, The Good Guys and Bing Lee.